The Anesthesia Patient Safety Foundation is currently embarking on a capital campaign to establish an annual Ellison C. Pierce Jr., MD, Research Award, the proceeds of which will fund a competitive grant aimed at improving patient safety. 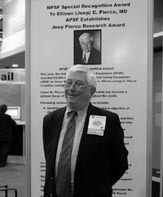 Dr. Pierce, President of the American Society of Anesthesiologists in 1984, played a key role in the creation of the APSF as an entity that could be dedicated to improving safety for patients undergoing anesthesia. Dr. Pierce was visionary in recognizing that true progress in patient safety would require the collaborative effort of physicians, nurses, drug and device manufacturers, the legal profession, the insurance industry, and governmental entities. Ellison C. Pierce’s vision evolved into a simple objective: "to ensure that no patient is harmed by anesthesia." The National Patient Safety Foundation (modeled after the APSF) provided a seed grant in honor and in recognition of Dr. Pierce’s outstanding contributions to patient safety. It is the goal of the APSF capital campaign to use these funds to further the cause of patient safety by establishing this research award in honor of Dr. Pierce. Dr. James F. Arens and Dr. E. S. Siker are serving as Co-Chairs of the Capital Campaign Committee for the Ellison C. Pierce, Jr., MD, Research Award. Contributions may be sent to: APSF, 520 N. Northwest Highway, Park Ridge, IL 60068-2573 and should be specified as a contribution to the Ellison C. Pierce Research Award. Further information may be obtained from The Anesthesia Patient Safety Foundation at 412-882-8040, e-mail: apsf100@aol.com. Ellison C. Pierce, Jr., MD, honored.